Before a note is played, everything about this album screams "pastoral acoustics, harmonies, just don't mention Fleet Foxes, we don't even like them and sound nothing like them anyway." As Loyd Grossman famously used to say; "let's look at the evidence". 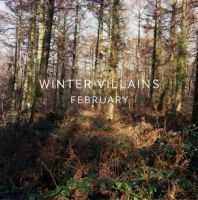 A band called Winter Villains, a cover shot that's, well, kind of pastoral and outdoorsy, an album called 'February' and a debut single called 'Moon'. There's a definite obsession with nature and the natural world and it would suggest this is transferred to the music. Do you have "canoeing music" in Wales? Or shall we go for "valley walking music"? Joking and cheap stereotyping aside, you can certainly get a feel for this record without having heard it. The crew that worked on it also give clues, with mixing and recording by Charlie Francis (REM, Turin Brakes) and mastering by Mandy Parnell (Sigur Ros, Mum). Our assumptions are correct, but the results our surprising. A timely release for an album that explores the beauty of winter, there may be comparisons to be had, yet Winter Villains can more than hold their own. The songwriting is of a high calibre, the arrangements and overall feel of the album even better. They've made the most of what they've got, and what they've got is already a thing of subdued beauty. 'House Of Knives' and 'Patterns' would stand up as simple guitar/piano and voice recordings, but the added extras make them truly shine. More wholesome and substantial tracks like 'The Air' and 'Icebergs', plus the chamber-pop stylings of 'Thorns' or 'February' give them that added zing. Of course no album of this sort would be complete without some harmonies, and when you're toying with these sounds they need to be good ones at that. We can happily report that things are near faultless on that front. So you may have heard plenty of this type of thing lately, you may even be looking to broaden your horizons having overdosed on beards and acoustic guitars, but before you give up the ghost and decide it's Norwegian doom-metal all the way from here onward, just hold your proverbial horses for a little while longer and cosy up for the winter with this Welsh mob. You won't regret it.